Around 56 million people are in need of urgent food and livelihood assistance in eight conflict zones around the world, a report said Monday. 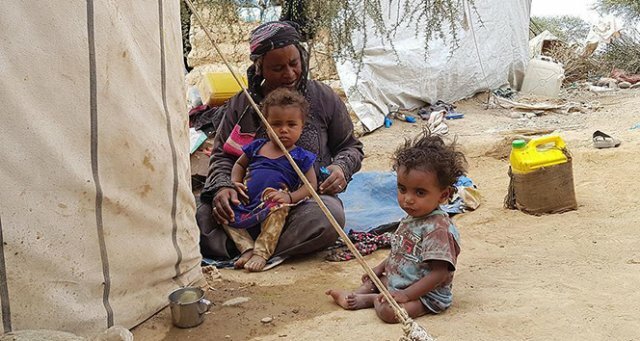 Yemen, South Sudan, Afghanistan, the Democratic Republic of the Congo and the Central African Republic are the five zones that experienced conflict-driven food insecurity the most in the latter part of 2018, according to the report. The report was prepared by the Food and Agriculture Organization (FAO) and the World Food Programme (WFP) for the UN Security Council. "The link between conflict and hunger remains all too persistent," it asserted. The other three conflict zones -- Somalia, Syria and Lake Chad Basin -- have seen improvements in food security in line with improvements in security. The report, however, said a "major deterioration” is projected during the 2019 lean season across Lake Chad Basin. The report "clearly demonstrates the impact of armed violence on the lives and livelihoods of millions of men, women, boys and girls caught up in conflict", said FAO director Jose Graziano da Silva. WFP Executive Director David Beasley urged "better and quicker access in all conflict zones" in order to reach more people in need. "But what the world needs most of all is an end to the wars," said Beasley. The report also said that violence against humanitarian workers is on the rise, which has forced aid organizations to suspend their operations and deprive vulnerable populations of humanitarian assistance.